If you want to rear a dog without having to clean up after it, then you ought to consider the SEGATOY robotic dog which is capable of responding to various stimuli like touch, voice commands and even boasts the ability to track you as you move around it. 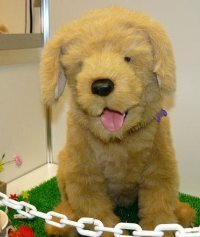 This robotic pooch can move various parts of its body such as eyes, mouth and head, tail and even shake its paw while responding to voice commands just like a real dog would. Too bad it can’t be trained/programmed to fetch my morning newspaper – maybe future versions will see it come with an LCD display on its body that downloads the latest RSS news feeds via a WiFi network. This nifty little toy retails for $270 a pop.